Every once in awhile I experience a meaningful coincidence that makes me laugh out loud. This happened a few days ago. 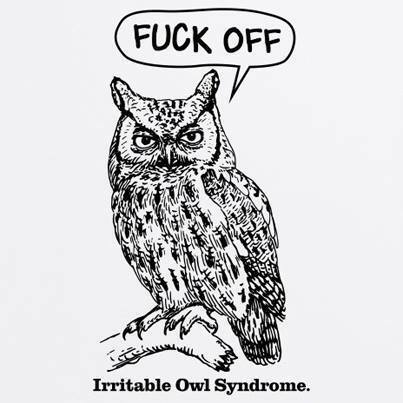 When you read the whole story, I think you will forgive the expletive in the owl picture below. Don’t peek! Before you look at the picture, keep reading, so as not to spoil the surprise, and join me in finding the humor as well as the message within the experience. I have experienced more than a few synchronicities having to do with bird symbolism. The cluster of synchronicities I am recounting here brought myself and two other people into personal connection with Owl—a powerful totem of the indigenous peoples of the West— who is known to provide messages from the other side of the veil. These beyond the veil Owl events began to take shape in my own life the day I read author Frank Joseph’s account of the huge pre-Incan Owl-headed figure carved on the side of a Peruvian cliff: “With its right hand it points at the sky, while its left hand gestures toward the ground, implying the soul’s flight from Earth to heaven” (1999, pg. 44). The image fully caught my imagination with newly constellated Owl imagery and myth, and I made a mental note to visit this ancient site one day when I returned to South America. The next afternoon, my neighbor Anna’s son Michael was in the process of pressure washing my back deck when a baby owl came to perch by him on the privacy fence surrounding my back yard. The young bird sat there for several minutes amidst the noise and spray of the machine, watching Michael work. When Michael related this owl sighting, we both found it strange since neither of us had ever seen an owl before in our suburban neighborhood. Also, the fact that owls are nocturnal and rarely make an appearance in the daylight hours made me count this as a meaningful coincidence related to my discovery of the owl etching and its symbolism the day before. When reflecting on the meaning of this coincidence, I realized that the idea of the “soul’s flight from Earth to heaven” could well be applied to Michael’s own life since his father, Keith, had died 10 months earlier. Later, when I told Anna about the event, she stated that she didn’t know if Michael’s owl sighting could be construed as a soul message from his father, but that there was definitely a ‘weird’ connection going on: she had placed, unbeknownst to Michael or me, a wooden owl on Keith’s headstone as a protection from negative energies just days before! Immediately after writing the above, I took a break to honor my daughter’s request to check out my new grand nephew’s birth picture that his mother, my niece, had recently posted on Facebook. The very first post in my News Feed as I logged on Facebook was—of all things—this funny Owl meme, shared by my friend Mary Ehrsam, a funny lady in her own right. After laughing out loud – Owl obviously had more to say! – I thought about the symbolism of the meme and what its meaning in my life might be. Was this just an amusing ‘underscore’ of the protection Owl provided at the grave site of my friend Anna’s husband? Since a symbol always has more than one level of meaning, I supposed that could be part of it. But I sensed there was more to it than that. Was it a message for me personally? A humorous ‘poke’ of synchronicity I would remember (I learn well through humor)? Yes, that, too. But I knew intuitively that its meaning went still deeper. Aha! The thought came to me that I had been sending someone in my life Ho’oponopono, the ancient Hawaiian practice, in the Huna tradition, of working on total forgiveness and realignment of a negative situation. It’s basically a way of sending love to a situation to heal it for all parties involved. But what I’d neglected to admit and deal with before beginning this practice was my deep-seated anger at someone over the situation. The reason I was doing H’oponopono is that I’d felt I’d been deceived and was taking total responsibility for this showing up in my life in the form of a lesson I needed to learn. Owl energy represents in part the ability to see beyond deceit and hidden motives. So, yes, that fit. Once I reflected seriously on this hilarious synchronicity, I realized I was, in fact, being alerted to honor darker feelings—not to act on the impulse, of anger, but merely to honor it. Once I got clear about that, I could feel the tension in my body in relation to the irritation I felt and began the process of letting it go. Check! Now, I’m feeling much more connected to the healing work of H’oponopono I began earlier. Thank you, Owl, for this Trickster lesson in honoring all of my feelings—the good, and not so good—and for helping me to transform the Shadow energy of anger into something useful to fuel my forgiveness practice! Owl is a power messenger. I love the trickster part of this synchronicity. I found a huge dead owl in my woods once, completely intact under an old tree near a swamp. It was amazing to look at it carefully, see the claws, beak, and feathers up close, and grieve for it. I buried it with a friend. Last summer, I drove home in a local flood. It was terrifying and dangerous. All the main roads were closed, but I just kept driving through those running rivers of water because I was in the middle of nowhere. Electricity was out everywhere. Using my GPS and inching along, I finally made it to the top of my hill. I felt alone and vulnerable as I never have. An owl sat in the road. I stopped and turned off my headlights. Owl swiveled its head 90 degrees and peered at me. It was soaked with water. I thought maybe it was injured because I’d never seen an owl just sitting in the road like that. It watched me for about five minutes. I felt calmed and protected after three hours of fear. Finally, a car came from the direction and owl swooped off into the woods. Not injured. My therapist and I worked with this image like a dream. My owl was a visitation of Hecate, She who knows the Dark. Thanks for sharing your Owl encounters, Elaine. I’m wondering…did you find the dead owl before or after Vic died? The reason I ask is because in both cases of my two husbands’ deaths by cancer, dead birds were involved. One, I hit with my car shortly before Gene died. And the other I found on our property in Florida shortly before Harold died. After their deaths, the symbolism changed: swarms – yes, swarms – of flying eagles overhead, hawks flashing their red tails in the sunlight, two cranes circling…many stories to tell. Love your encounter with Owl on the road and the Hecate association. Owls are awesome birds, and I believe their multilayered symbolism goes way back in our collective memory. “Now, in a shift of light, the shadows of birds are more pronounced on the gallery’s white wall. The shadow of each bird is speaking to me. Each shadow doubles the velocity, ferocity of forms. The shadow, my shadow now merges with theirs. Descension. Ascension. The velocity of wings creates the whisper to awaken….